Several years before I became a ham, when I first camped at Glacier Lake, this group of peaks called to me. I didn’t get around to climbing any of them that first time, but came back a couple of years later to camp at Glacier Lake, and decided to go for it. We chose the highest peak, since it had the most obvious approach, and it’s a short hike if you happen to already be camping at the lake. It’s a steep hike, followed by a scramble to the summit. Once I started getting into Summits on the Air, it wasn’t long before I checked to see if this summit qualified. What a great excuse to go backpacking to Glacier Lake again! Black Buttes became a must-do part of the itinerary for my backpacking trip with a group of friends, though I would end up being the only person in our group to do it. The route I’m showing on here starts at Grouse Ridge (where we parked for our backpacking trip). From the paved roads, there’s about 5 miles of rough dirt road to Grouse Ridge. I’d recommend a high-clearance vehicle. We had a nice hike in from Grouse Ridge, but after arriving at Glacier Lake and seeing it was a bit crowded, my group actually ended up choosing to camp in Five Lakes Basin for a little bit more solitude. My approach for Black Buttes ended up being a cross-country trek from Five Lakes Basin, back up to Glacier Lake, then to Black Buttes. We also had two more of our group showing up the next day, so it was a perfect opportunity for me to go enjoy this summit. Arriving at Glacier Lake, you’re rewarded with excellent views of the lake and surrounding peaks from the ridge above the lake. The ridge of the Black Buttes surrounds the lake on two sides. The first time I climbed this peak, there wasn’t any snow. This time, there were multiple large snowfields. Very beautiful, but requiring a little bit more approach strategy. Not having brought any snow-travel gear, I would have to avoid the steeper sections of these snowfields. I crossed the flatter sections toward the bottom, around the south end of the lake, over to a bare rock section. Up and over the rock section, and across some more snow. The snow was dense but soft. There weren’t any issues around sinking into the snow. In places, these snowfields are several feet thick, and they’re on the north-facing side of the ridge, so they’re going to be around a while. After crossing the snow, there’s a steep, mostly grass-covered slope. I continued hiking up this diagonally to the east, both to avoid steeper sections and to avoid more snow. Working my way up this slope, I was rewarded with excellent views of the summit. After gaining the ridge, I checked for cell service. I was hoping for coverage here, due to the ridge’s proximity to I-80. I did indeed have service, so called the two people in my group who had to come in later than us, and would be expecting our group at Glacier Lake. I gave them a heads-up on road conditions and discussed timing. I determined I’d have plenty of time for my summit activation and a swim in Glacier Lake afterwards. Continuing up the summit ridge, now to the west, I approached the summit block and started the (very) short class 2-3 scramble up the rocks. Other than lots of loose rocks (check your hold before proceeding!) it was very straightforward. I have to admit, though, I was a little bit nervous with the moderate exposure and strong winds. 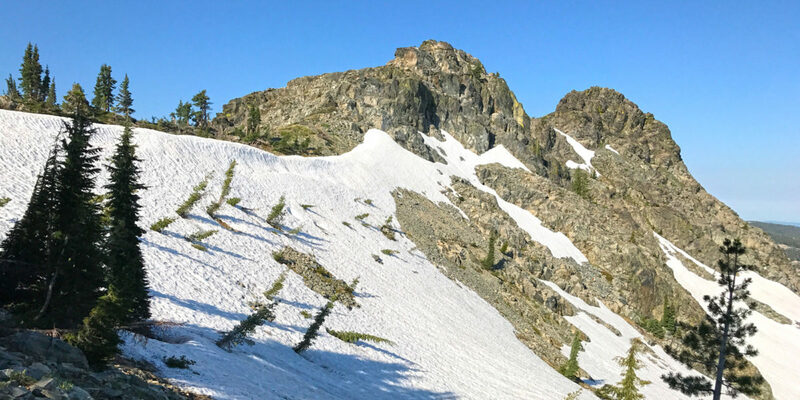 Climbing up through the several tiny mounds of rock that make up the summit, there are excellent views in all directions, and the snowfields and lake below are in clear view. I climbed up to the highest of the little peaks, and tied off one end of my end-fed half-wave antenna wire to a rock. I then ran the wire over to the next rock outcropping/mini-peak and tied it off there with some slack. Since there were high winds, rather than just stretch the wire horizontally across the gap, I decided to use the 7m/21ft “squid pole” I had with me. I wedged this securely into some rocks, leaning into the wind, and used it to support the center of the wire. This took the slack out of the wire and made everything a lot more stable. I set the radio on some rocks and had a nice little standing operating position. I started out finding a clear frequency on 20 meters, spotting myself with the SOTA Goat app, and calling CQ. I had contacts start rolling in right away. I’d even go so far as to say I had a mini-pileup. About 10 minutes in, I had 8 contacts—including one S2S with WB0USI over on W6/NS-132, Babbitt Peak, about 28 miles away. We must have had really clear line-of-sight, because his signal was quite strong! After the contacts started to dry up on 20 meters, I took a break to have some food and enjoy the views. Then I switched to 40 meters and got several more contacts. Once those stopped coming in, I went back to 20 meters for a while. There, I got three more contacts, including another S2S, this time with WA7JTM on W7A/AW-010, Mingus Mountain. He was a bit harder to pull in than the previous one, but we made it work! I then got a text from my buddy Austin, K6ABM, asking if I was still on the summit. He’s over in the SF Bay Area, and asked if I could wait a few minutes while he set up an antenna. Sure! We managed to exchange signal reports, but that was about it—it was really weak signals in both directions, but we did it! Having gotten the two S2S QSO’s, I was inspired to check for any other spots I might be able to chase. I saw several CW-mode spots, so I listened for one of them. I was able to make out “CQ SOTA,” but had a lot of trouble with the rest, due to adjacent stations and lack of narrow filter. So I decided this wasn’t the day I’d start working CW on my SOTA activations. It was so beautiful here, I could have spent the whole day making contacts on the radio until my battery died. But once responses to my CQs stopped coming in, I figured I’d pack it up and head down to the lake for a swim. Besides, 20 contacts in one SOTA outing was definitely a record for me. I went back up to the top, where my antenna was tied off, and did a 360-degree photo with Google Street View. I had my Yaesu VX-2R handie-talkie out the whole time, but didn’t try too hard to make contacts on it. While packing up, I figured I’d give it one more shot. I managed to get one somewhat shaky QSO there, but a QSO nonetheless. It’s always fun to see how many bands/modes I can work with what I have available. The trip back down was pretty easy. I went a slightly different route, more directly on top of the ridge, so I could explore the big snowfield a bit more. On the way down, I ran into a few other hikers/climbers headed for the top. We chatted for a bit. It turns out one of them was a ham, and had run into another SOTA activator (WB0USI, I think) on signal peak just a day or two earlier. Small world! After getting back down, I enjoyed a dip in the (almost) ice-cold Glacier Lake. It’s definitely a great way to cool down on a warm day—but it’s definitely shockingly cold! This was definitely one of my most fun, challenging, and pleasant summit activations. Thanks to all the chasers!